The white-bellied minivet (Pericrocotus erythropygius) belongs to the family of cuckooshrikes and minivets, the Campephagidae. The white-bellied minivet is endemic to India. Until recently these minivet species were considered conspecific with P. albifrons. These minivets are monotypic species. The white-bellied minivet (Pericrocotus erythropygius) is a small-sized minivet, measuring 15 to 17 cm in length. The white-bellied minivets have whitish wing patch and orange on the rump. The sides of the tail are whitish. Males have blackish head and upperparts, whitish underparts and an orange breast patch. In females, the upperparts are grayish brown and the underparts are whitish. The bill is strong, pointed and black in color. The irises are dark. The legs and feet are blackish. The call of these minivet species is a thin, whistling, "tswee..tswee" or "tsip..tsip" sound. 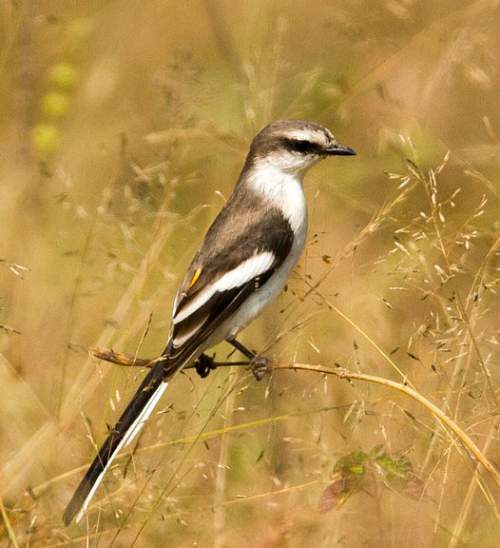 These white-bellied minivet species are endemic to India. These species are distributed in the states of Tamil Nadu, Karnataka, Andhra Pradesh, Telangana, Maharashtra, Gujarat, Rajasthan, Haryana, Uttar Pradesh, Madhya Pradesh, Odisha, Chhattisgarh, Jharkhand, West Bengal and Bihar. 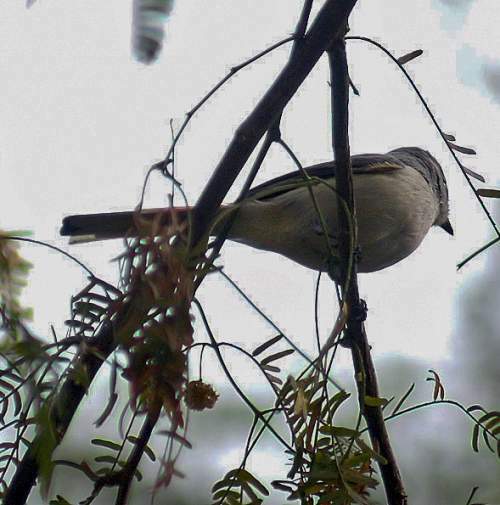 These white-bellied minivet species do not normally occur in forests. They normally occur in altitudes from 0 to 1000 meters. The artificial ecosystems and habitats of these species include cultivated lands and fallow lands. The natural ecosystems and habitats of these species include, tropical and subtropical dry grasslands, dry savanna, tropical and subtropical dry shrublands and thorny thickets. The diet of this white-bellied minivet consists mainly of insects. Grasshoppers, crickets, locust, cicadas, spiders and beetles are their primary food. They feed from the ground as well as from the branches of shrubs. 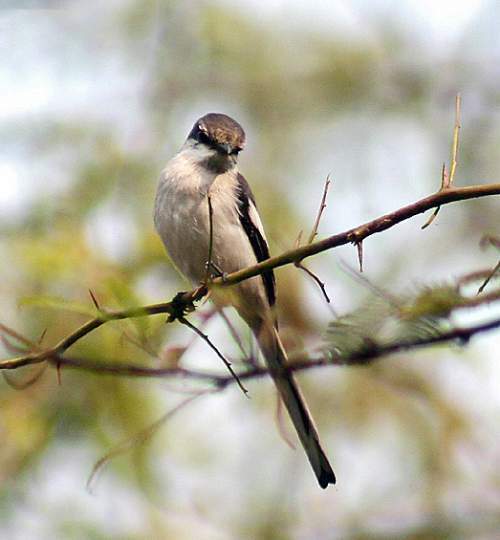 The breeding season of these white-bellied minivets is from June to October in most parts of India. These birds are monogamous and strongly territorial. The nesting sites includes branches of shrubs and small trees. The breeding pair build a small cup-like structure with grass and plant fiber. The nest is lined with soft grass. The clutch contains 2-4 eggs. These minivet species are non-migrant resident birds. They disperse locally after breeding. They also show nomadic behavior. The global population size of the white-bellied minivet (Pericrocotus erythropygius) has not been quantified. The overall population trend of the species is considered to be stable. In most of its range, this species is reported to be uncommon to rare. The generation length is not known. Its distribution size is about 2,480,000 sq.km. Habitat alteration and destruction, hunting and capture of adults and juveniles for pet-trade are the main threats that are endangering the survival of these species. The white-bellied minivet (Pericrocotus erythropygius) does not approach the thresholds for being Vulnerable, either under the range size criterion, or under the population trend criterion or under the population size criterion. 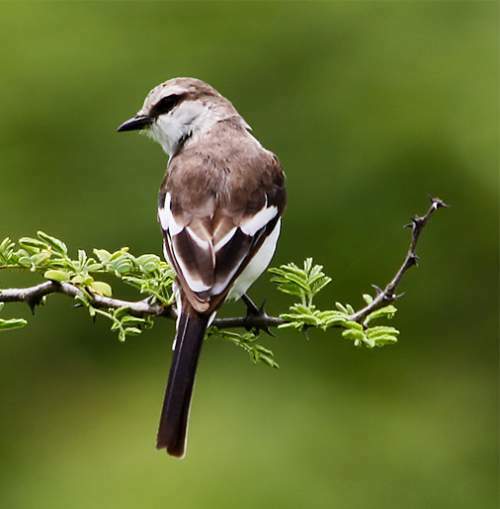 The CITES (Convention on International Trade in Endangered Species of Wild Fauna and Flora) status is ‘Not Evaluated’ for the white-bellied minivet (Pericrocotus erythropygius). The white-bellied minivet (Pericrocotus erythropygius) is closely related to the Jerdon's Minivet (Pericrocotus albifrons). Earlier P. erythropygius was considered conspecific with P. albifrons. Current topic in Birds of India: White-bellied minivet - Pericrocotus erythropygius.